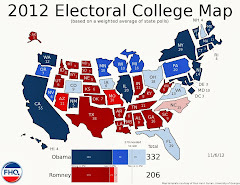 Frontloading HQ: Connecticut Republicans Looking Toward 2016 Caucuses with Presidential Primary Seemingly Anchored in Late April? Connecticut Republicans Looking Toward 2016 Caucuses with Presidential Primary Seemingly Anchored in Late April? Two Republican-sponsored bills to move the Connecticut presidential primary to the first week in March have been bottled up in committee within the Democratic-controlled state legislature since being introduced in late January. Republicans in the Nutmeg state, however, are apparently not content to conduct the party's delegate selection process in a primary on the last Tuesday in April. The impasse has the Connecticut Republican Party considering a switch to caucuses at an earlier point on the 2016 presidential primary calendar. A task force created by the Connecticut GOP is seeking legal opinions on whether Republicans could bypass the Legislature to adopt the caucus model, an alternative that the group's chairman, Bridgeport's Michael Garrett, said is intriguing to party. "They're open-minded," said Garrett, a Republican State Central Committee member. Based on preliminary discussions, a GOP caucus would be held in each of the state's 36 state senatorial districts, with the state party printing out standard ballots and local Republican Town Committees shouldering election administration costs, according to Garrett. If a change in the law is required, Garrett acknowledged that the plan doesn't stand much of a chance. Connecticut Republicans would be on firm ground legally if the state party voted to switch to a caucuses/convention system. That is a matter -- the rules behind the nomination of a party's candidate or in this case reflecting presidential preference in the state for that purpose -- that is left up to party discretion. 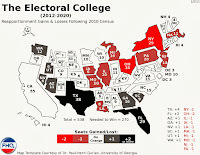 Republican candidates would still appear on the April primary ballot, but the primary would be a beauty contest for Connecticut Republicans, falling after the proposed earlier caucuses that would have initiated the delegate selection/allocation process. Democrats in the Nutmeg state would/could continue with the primary. That would allow Connecticut Democrats to align their nomination contest with the primary in neighboring Rhode Island. 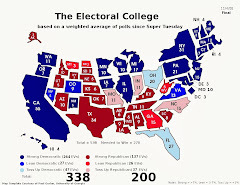 If New York moves back into April that would connect Connecticut, Rhode Island and New York with contests in Pennsylvania, Delaware and likely Maryland. Republicans, assuming the state party moves to a date in March, could caucus on March 1 which would group them with other primaries in the region in Massachusetts and Vermont. 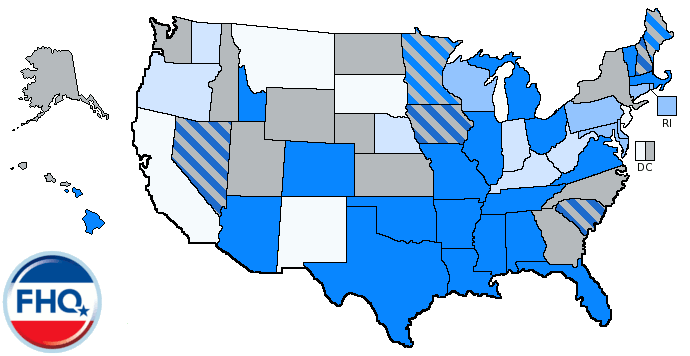 Though there would appear to be an appeal to going earlier, even among Democrats, that is balanced by the fact that Connecticut Democrats stand to gain delegates for having an April primary and, if New York joins the discussion, for clustering its contest with two or more regional partners. [This was something that Joe Lenski and FHQ discussed in a Twitter back and forth back when the aforementioned Connecticut bill were introduced.] The Democratic nomination race is also shaping up to be far less competitive than the Republican race, decreasing the urgency to move up to an earlier calendar position among state Democrats. FHQ really wishes Mr. Vigdor had not recycled some of the problematic material from his article two months ago on the two bills to move the Connecticut primary. We dispensed with that already.